My first tapestry came about when I embroidered a piece that hadn't felted together well. My first wet-felted piece that lit the spark. Nature inspires my work. As well as using nature as a frequent image in my work, I also use natural fibers, such as wool, silk and cotton, plant based dyes, organic indigo, and local leaves and blossoms. I began as a knitter, which led to wet and needle felting and then added natural dyeing, eco printing and indigo and shibori to my repertoire. Lately I've been working with hand stitching and shashiko techniques in the spirit of the slow stitch movement - allowing the time spent stitching to be a calming and meditative act. 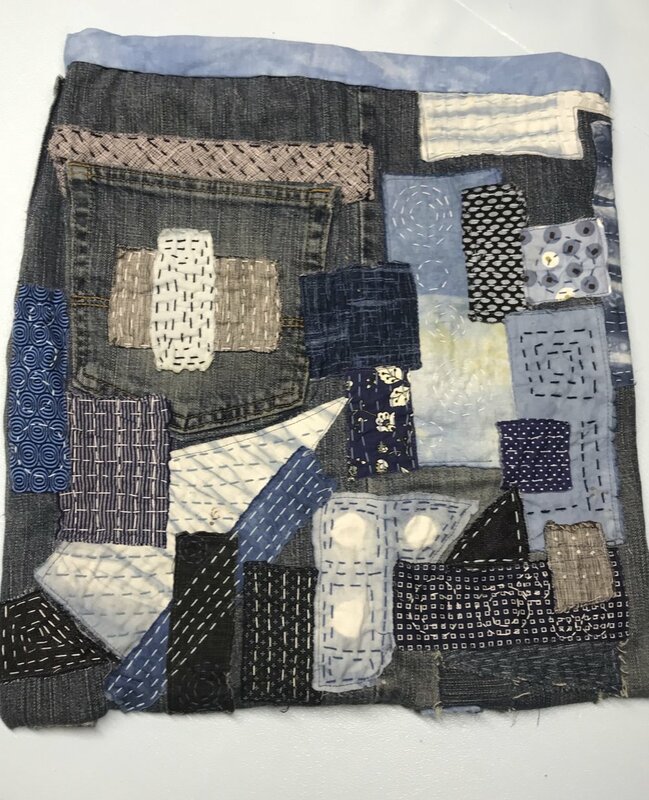 I'm also challenging myself to use my sewing scraps, dye samples and shibori practice pieces in creative and artful ways. I hope that you will discover something that I’ve made that will inspire you and awaken your sense of beauty, joy, and your own creative self. Eco print on watercolor paper. A Japanese market bag prepared with shibori techniques and dipped in organic indigo. Sewn from one long, narrow piece of fabric folded three times and stitched with two seams. Shashiko/boro style stitching on a tote bag made from a pair of my husband's discarded jeans.